During the hot, dry month of August 1992 the farmers of Baishan village in Hebei province and Panyang village in Henan came to blows. Residents from each village hurled insults and rudimentary explosives at the other across the Zhang River – the river that feeds the Red Flag Canal Irrigation System and forms the border between the two provinces. The emotions of that afternoon were fuelled by events of the previous night when 70 Baishan villagers had waded into the river to build a barrage to divert water to their fields. Upon hearing of the treachery, Panyang villagers assembled to drive the dam-builders away. Two days later, Baishan villagers crossed the river to the Henan side and dynamited an irrigation canal that watered Panyang’s fields. Struggles over water are not new in China or around the world. But these struggles have their own unique historical and cultural contexts. Climate, geography, and social forces all combined to escalate tensions over water resources on the North China Plain during the 1990s. In the early 1960s when the Red Flag Canal was constructed water was plentiful. The canal was a showpiece of Chinese hydraulic engineering that was begun during the Great Leap Forward, and celebrated as an exemplar of massive surface water irrigation development. But after the 1980s, upstream withdrawals for irrigation and local industry dramatically expanded competition for water downstream. The story of inter-village dispute was an early indicator of water stresses on the North China Plain. Post-Mao reforms increased both consumption and pollution of water, and China’s 30-year boom brought the North China Plain close to its limits. Dramatic solutions, such as large-scale inter-basin water transfers, were invoked to sustain a semblance of ecological balance. Total available water resources declined from 41.9 billion m3/year in 1956 to 32.5 billion m3/year in 2000. Per capita water availability plunged from 735 m3/year in 1952 to 302 m3/year in 2009 while overall consumption skyrocketed. Household consumption has increased by 150% since 1980 and, by the turn of the millennium China was experiencing a significant regional water dilemma. As industrial growth, urban expansion, and intensification of agriculture continued at breakneck speed, efficient allocation of already scarce water resources in the Yellow River valley and the entire North China Plain became a critical issue. On the economic front, allocating water to sustain growth in all sectors was one policy option, but data also suggested that increasing occurrences of rural unrest in the early 2000s were fuelled by frustrations over supplies of clear water, raising concerns about social stability. China’s water challenges can only be fully understood from a historical perspective. Past cultural choices and physical realities of the North China Plain continue to shape the present and the future. Even in the Maoist period (1949-1978), when the regime attempted unprecedented development of water resources on the North China Plain in what looked to many like a “war on nature,” developmental means and goals were shaped by patterns that dated back centuries. The North China Plain has long been among China’s most ecologically vulnerable areas. The region receives much less rainfall than the south, and what rain it receives is concentrated in the summer months. This climate has generated a series of large-scale floods and famines that have devastated local communities. 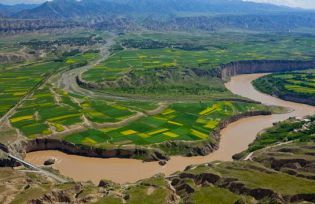 The Yellow River that carries massive amounts of silt from its middle reaches has shaped the human ecology of the North China Plain. The region has also long been one of the most critical agricultural regions in sustaining state and empire as it produces half of China’s wheat, and one-third each of its maize and cotton. Nearly one-quarter of China’s population resides on the North China Plain. State efforts to manage the ecology of the North China Plain have a long history, and many different eras of Chinese rulers have spent massive resources on preventing or controlling floods. The state in imperial China also sought to mitigate economic dislocation during periods of famine by setting up state granaries from which officials released grain during periods of privation to dampen the inflationary effects of shortage. Indeed, guaranteeing food security remains a fundamental concern of China’s current leaders. After 1949, China’s leaders vacillated between Soviet-style grand projects and smaller scale Maoist schemes. The former were typified by large-scale, technological, centrally-controlled and capital-intensive projects, while the latter focused on local knowledge and management, mass mobilisation, and self-reliance, with unique consequences for China’s water resources. Mao’s aggressive water development had mixed results: mass mobilisation generated substandard irrigation system, damaged soil fertility through poor drainage and over exploited water reserves. The expanded irrigation did raise agricultural production, which helped to feed a growing population, but the longer term outcome was over exploitation of water supplies. Today, China’s rapid economic development has generated an enormous demand for energy and water. Industrial development, urbanisation, and structural changes in agriculture have all increased demands for water. Political leaders are well aware that depleted and spoiled supplies have the potential to create social instability, and that in some former Soviet states, environmental movements fed into broader reform movements. China faces a difficult balancing act – how to allocate enough water to rural areas to ensure agricultural productivity and social stability, while providing enough to industry to maintain economic growth. Water management today has been shaped by practices extending back centuries. For example, continuous investment in a massive system of dykes along the Yellow River has left China’s water planners with a difficult legacy. On the one hand, large-scale engineering – as in the massive South-to-North Water Diversion project– remains powerfully attractive to contemporary Party leaders. On the other hand, both water allocation and pollution have impelled a re-examination of engineering in favour of demand management. What is clearly different today is China’s integration into global trade networks, which make China’s resource challenges a global concern. David Pietz is author of The Yellow River: The Problem of Water in Modern China (Harvard, 2015).